Here’s some outfit inspiration for your Wednesday morning!! I love this ruffle sweater from J.Crew’s batch of new arrivals (plus you can get 25% off your purchase and an extra 40% off sale styles using code HOPTOIT through Sunday!!!). You can shop all of the new arrivals here! I hope you have a great day, thanks for stopping by! In love with that ruffle top! These are all cute! I really love the loafers and sunnies! That ruffle sweater is so fun and I love those flats! What a cute top! I love the frill details and how you’ve styled it with the white denim, so cute and perfect for spring! Thanks for sharing and I hope you have a great day! Lovely blog, it loads genuinely quick and looks very cool. LOVE that ruffled top, so cute! Oh I love that ruffle top. It’s perfect with the white pants!! That navy top is gorgeous! I love the shoes! Such cute picks for spring! Love that cute tote bag!! 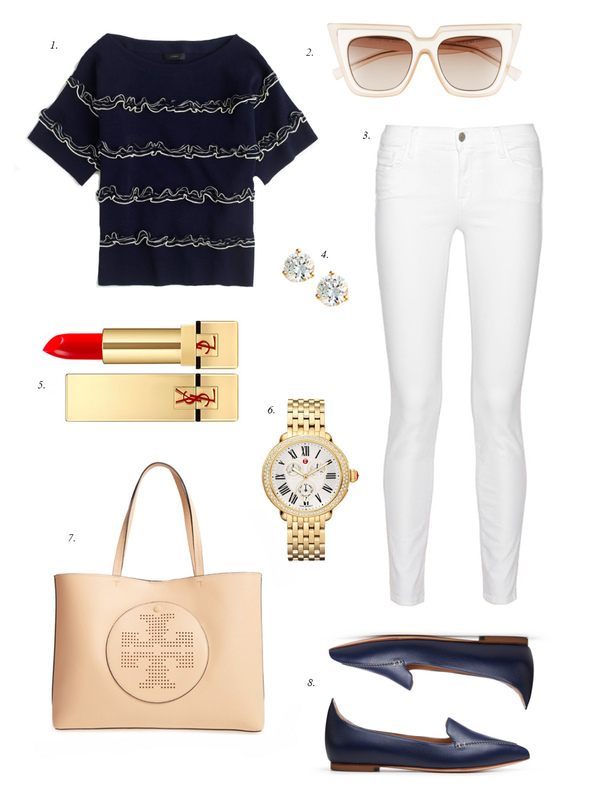 Navy and white is a perfect combo for Spring. Love this idea and I am totally using this for fashion inspo! Thanks for sharing!